We just got back from a solid weekend in one of my favorite towns, (Madison, Wisconsin) where we raced the 2012 Ironman Wisconsin. I attended this race last year supporting Whit, and when she announced she would return this year I couldn’t help but jump in myself. A few things about this race. Ironman Wisconsin is NOT an easy race. Of all the Ironman’s I’ve raced, the IMMoo (as it is affectionately called due to the cows in the area) bike course is the toughest. Runtri.com has ranked Wisconsin as the toughest Ironman brand race actively running. (Click here for comparison). It is also the only race my father has ever dropped out of. He raced IMMoo in 2005, a year that goes down in history due to a brutal heat wave. 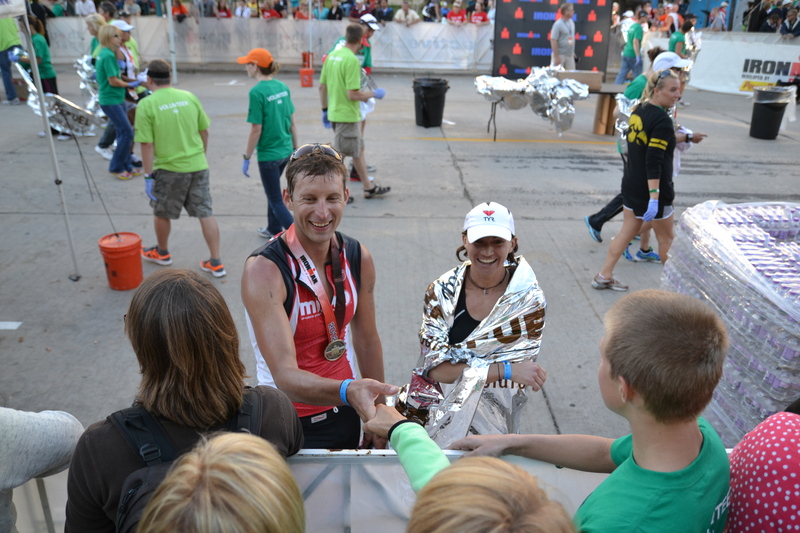 The 2005 IMWI has the third highest drop out rate of any ironman event. So I wanted to get some McCain family revenge. Whit and I arrived in Madison late on Thursday night and were met by Bret Newcomb, the father of the family who we were paired with for host housing. He had his son, Gus, with him as well. 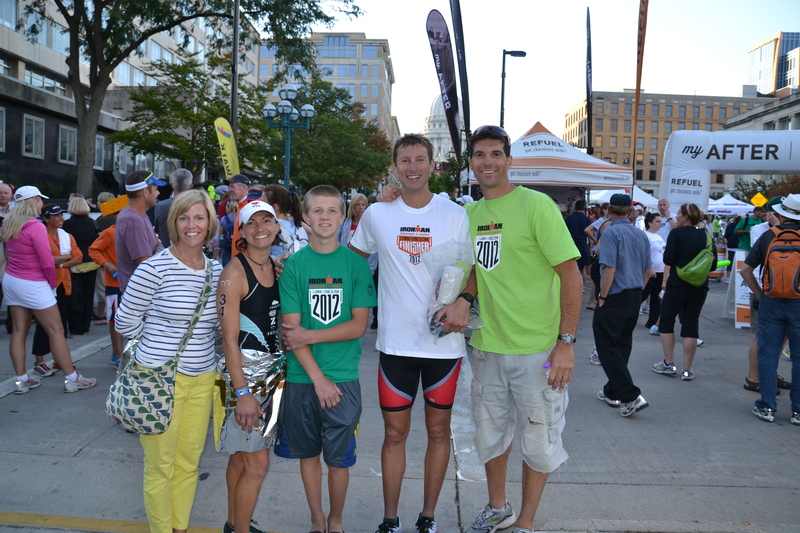 Gus is an up and comer on in triathlon and a very talented athlete himself. We gathered our luggage and headed to their house, which was beautiful and located just outside of town in Middleton. Friday was full of race rituals, swimming, packet pick up, and Bret even drove the course with us to get a solid reminder of what was to come. Friday evening we went to dinner with a great group including Tim (an old friend and teammate from King) and David Buntin who’ve we’ve met from triathlon. They both live in Chattanooga, and we’ll see them again in a few weeks at the StumpJump Ultra. We were also joined by Billy Edwards (Boulder training partner) and Jackie Arendt (Female pro from Madison) as well as a few others. We hit a trendy TexMex place downtown and had an excellent dinner. Saturday we woke up, worked on our bikes, then headed out with Gus & Bret for our usual pre-race ritual. We then simply prepared for the race and relaxed. Saturday night was exactly what we need. We set down with the Newcombs and played Cranium for a long while. It was made even more special by the fact that is was Rachel’s (mother of the family) birthday. She was such a great sport to share her birthday with us. Bret and Gus drove us down to the race. They were Volunteers for the swim course and needed to get there at about the same time we did. We checked our bags, bikes, and were ready to roll. As I went to the swim start, I realized that my timing chip was missing. FREAK OUT TIME! I finally found the timing tent and got a new chip, phew. A few minutes later, I asked a spectator to help me zip up my wetsuit… and I heard her say “Why on earth do you have your timing chip inside the neck of your wetsuit?” Oh no, now I have two timing chips! I ran back to the tent and got it sorted out again… for a second time. The transition at IMMoo is a lot of fun as you run through a crowd then up three flights of a helix parking structure full of screaming fans. It’s exciting, and a rush. The changing tents are inside the convention center, then you run out to your bike and head back down the helix. As I noted earlier, the bike course is TOUGH but fun. The route is a double lollipop that goes through several small towns. I rolled out well and passed quite a few people in the first 12 miles of the bike. As the race thinned out, I settled in to my effort, which I watched closely on the climbs. At about mile 22, we reached a short but stout climb that is located by the Newcomb’s parents house. We knew the Granpa Bob and Chris (grandmother) would be on the hill cheering. Sure enough, when I rode by they were up there with HUGE signs and smiles. I cruised over to them and gave them both high fives! It was great to see them. The hills on this course are not killer individually, but they are relentless. The hardest climb is Sauk Pass, which is where many fans lined the streets partying and cheering. They are so much fun that you almost forget about the climb. Near the top of the climb, I saw the Newcomb clan on the side cheering. I shouted to them and got some support before dropping down the back side of the climb. I kept rolling the bike course and stuck the plan for an easier effort and natural nutrition. The second loop was fairly uneventful, except for when I came down one of the fastest descents I saw Bret and Gus on the side of the road on their bikes. I gave them the “hang loose” sign as I blazed by at 45mph. I arrived at T2 with a bike split of 5:29 (20.4 mph), right on target. T2 was nothing spectacular. As I left though, my back felt locked up, and I knew it would take a bit to unlock it. The marathon course at Wisconsin is basically a two loop out and back that weaves through downtown and the University of Wisconsin. The fans on the run are AWESOME. They are best downtown near the capital, on State St (bar area) and on the back end of the loop out where you can see runners come by three times in a matter of minutes. At mile 3 or so, you enter in to the U of W football stadium and do a loop around the field. This is a strange feeling. Being in such a huge stadium that is deathly quiet is surreal, but also fun. At mile 6 I saw Whit heading the other way. She didn’t look great, but gave me a look that said she loved me. It made my heart happy to see she was ok. I cruised along until about mile 16 where I once again hit the wall, and had to start walking aid stations. I’ve got to figure this part out as it gets me every time. Regardless of the slowing pace and walking, I kept plugging along and couldn’t have been more relieved than when I saw that 25 mile marker. I kicked it in and saw the entire Newcomb clan on the sides as I neared the finish line. I gave them high-fives, crossed the line, and was greeted by Whit. Now this was the way to finish an Ironman! Though I’m not particularly happy with my time, 10:51, I enjoyed this race to the utmost. I love Madison, the people are outstanding. The Newcomb family, well, they will be life-long friends. They were nothing short of “family” to us and we owe them more than we’ll be able to repay in the near future. Now that triathlon season is over for Whit and I, we will plan for a 3 day bicycle tour of eastern Colorado in a couple of weeks, followed by a 50k in a month! No rest for the weary, but all these events will be low-key, high-enjoyment.